Good Morning Angels teamed up with Operation Healing Hands and Intercare Hazeldean for free Cataract operations. BACKGROUND: “I never thought I would be chosen. The doctor and team have no idea how they’ve changed my life. 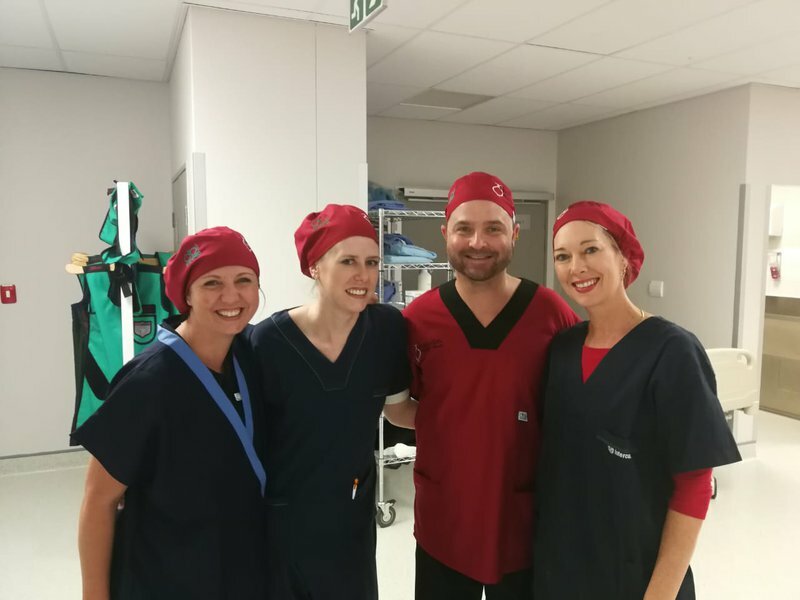 The world just doesn’t work like that anymore: people just helping people out of the goodness of their hearts.” This was the reaction of 38-year old Mike van Wyngaardt from Polokwane, after his free cataract surgery this past week at Intercare Hazeldean. Mike is one of 45 patients who received free cataract operations to mark Eye Care Awareness month in South Africa from 23 September to 18 October 2018. At least 80% of all blindness is preventable and one of the most common causes of treatable blindness or impaired vision is cataracts - a cloudy layer that forms on the eye lens. Because cataracts form over time, it is usually associated with old age. In reality, cataracts are the leading cause of avoidable blindness in children too. Cataract surgery is quick and mostly successful, but costly - up to R27 000 per eye in private facilities, while lists in State Hospitals are up to three years long. Good Morning Angels invited submissions from needy eye patients and many of them were assisted after a successful screening process. From the attached letter you can see that my dad did go for his eye tests. He was told in Feb/March that they want to make him part of a ‘trial ‘ from America whereby he would not have to pay for any tests or operation. He had to take of work to do these tests and if he did qualify he would get the operation but would then have to pay between 23 – 33 000 Rand which he doesn’t’ have. I also think that he didn’t qualify and even if he did he didn’t have the money to pay for it. I also think he misunderstood because it was not going to be for free, but he tried. He is 68 years old, he is still working as a driver (chemicals) as he needs the money to provide for him and my mom. He does not have a medical aid and he did get an appointment to see a doctor on the 3rd of December at Helen Joseph eye hospital but not sure if they will take him. My mom also goes to Helen Joseph and it is a painful process. They sit there from 6am in the morning and come home between 4-5pm in the afternoon just to see a doctor, not a specialist, same thing for medication. It doesn’t matter if you are there first in the morning, they really just help who they want to help and you might go there and they don’t have your appointment, this has happened to my mom. I would really be so grateful if you could in any way consider helping my dad. He has not been without a job since he was 16/17 years old. He hasn’t had a luxurious life, he is happy with the least amount of wordly things in his life and he NEVER complains about anything. He gives his 100 % in all he does. He doesn’t even want us to buy him birthday or Christmas presents as he is worried we wont have money, he never wants to be a burden to anyone. I know he is worried about his eyes, he won’t complain because he doesn’t want to cost anyone money but this needs to be done. I just have to tell you, he has had 1 car accident in his whole life, really, this was last year and wasn’t his fault, he is such a careful, cautious driver and he has NEVER been in hospital for anything even when he has been very sick he would not go as he does not want to be a financial burden to anyone. My oupa Ernie Pawson sukkel vreeslik met sy katarakke. Hy is 76 jaat oud en sukkel om te bestuur. Hy is ons enigste vervoer werk en skole toe. Hy het nie die geld om te gaan vir n operasie nie. Sy lisensie verval in Januarie en hy weet sommer hy gaan dit nie kan hernu omrede hy nie die oog toets sal kan slaag nie. Dis n groot probleem vir hom omrede hy afhanklik is van homself . Hy kort hierdie rerrig sodat hy beter kan sien . Hy sukkel vreeslik. Hy het nie n medies nie en dit is n groot proses om by ons staats hospitaal gehelp te word. I saw on Facebook you may help people with a Cataract operation. Mike is 38 yrs old. When he was younger he helped his dad with work. He did welding work, a spark got in his eye he never thought to check it out at that time. As he gets older he started to get a lot of headache so he was told to go tests his eyes. That was a couple yrs ago. He got classes to wear since he was going blind in his one eye. The spark he took when he was younger chipped/cracked his lens of his eye. In 2016/17 when he went to get his driver license he failed his eye test was sent to a Dr. A second Dr said he will help him at that time to get a license but before next renewal he must get his eyes fixed and it would cost R25 000. Well, we thought 5 yrs is a long time to make a plan for that but we have children! Mike can't drive since his sight is blurry. He needs to fix his eyes - without him he can't take kids to school, he can't work and get a salary to support us if he should go blind. Daytime is hard for him too - sharp sunlight gives him severe headaches. We don't have the money to fix it. But I do pray someone will help one day, just to make some part of our lives a bit better.